M4-ATX is an intelligent, high power, vehicle (car / boat / electric cart) DC-DC ATX PC power supply designed for use with car pc or general purpose battery powered applications. 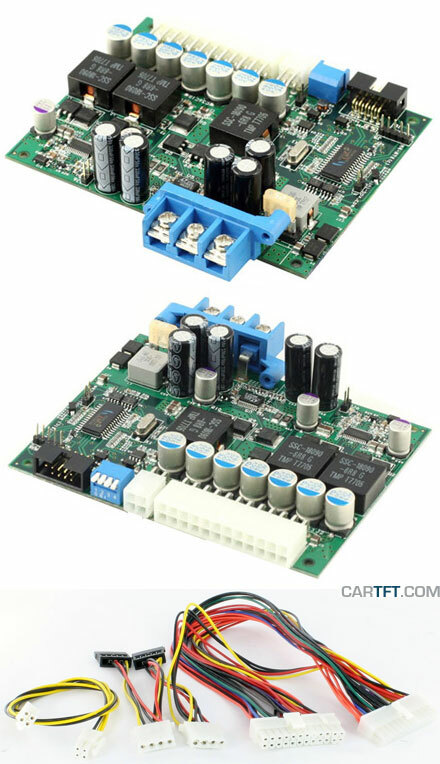 Designed to provide power and to control the motherboards's ON/OFF switch based on ignition status, M4-ATX is a wide input (6 to 30V) vehicle / car / battery operated ATX power supply capable of surviving tough car engine cranks (down to 6V) as well as transient over-voltage situations. Connect it to your car / boat / RV / solar battery and power up your PC! - Programmable shutdown / sleep modes via optional serial cable. - Operates from 6-30V, multi-chemistry batteries supported. - Works with any Intel Core Duo as well as all VIA or AMD processors. 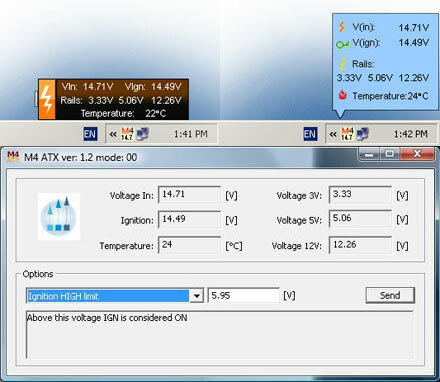 When you connect M4-ATX by USB with your PC, then you can control voltages and temperatures with the control software. With the Advanced software version you even are able to change the behavior of the power supply. I love it. One thing that got me, is trying to get it to come up with 12V and IGNITION connected at the same time. It won't come up that way. Since i'm using it with a car battery and charger as a UPS, i simply left IGNITION disconnected. That seems to work. The Unix software download here is outdated and 12V displays as 9V . When you build the current version found here https://github.com/ktossell/m4api it will indicate the right voltages. Works good, does not generate too much hot, I have mount a system with a Mini-ITX, i7 7700, 6 SSD, 1 video capture PCI board and 4 LCD monitors. Hardware: macht ein sehr guten Eindruck. Funktion und Spannungsfestigkeit weisst keine Beanstandungen auf. Hinweis, dass bei einer Leistungsabnahme von über 150W ein Lüfter eingesetzt werden muss, ist kaum auffindbar. OTTIMO PER CHI DESIDERA ALIMENTARE UN COMPUTER IN AUTO! !